Better late than never. I am so glad I picked up this beautiful matte lipstick on sale. You see, I have been interested in matte lipsticks for some time now despite my usual preference for lipsticks. But, the doubts - matte lipsticks might look aging on me and dry up my poor lips! So I didn't want to spend too much on something I wasn't sure that I'd get much use out of. After trying Revlon Super Lustrous Matte Lipstick Sultry Samba, I even feel encouraged to wear matte shades on my lips more often. Maybe I worried for nothing, or we now live in a better world where we can get quality matte lipsticks at affordable price. It seems intense brighter colors tend to look more beautiful in matte finish, too. Maybe this makeup game is about the balance more than anything. Sultry Samba is a part of the Revlon summer collection of last year, Rio Rush by Gucci Westman. It is supposedly a limited edition but still available online. 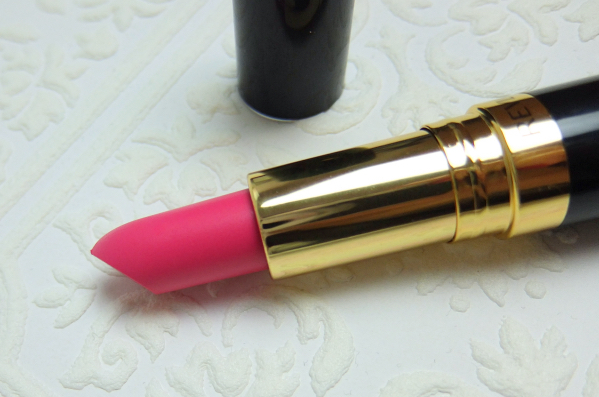 Sultry Samba is a beautiful hot pink with a hint of plum. It is bright but easily wearable for many different skintones. 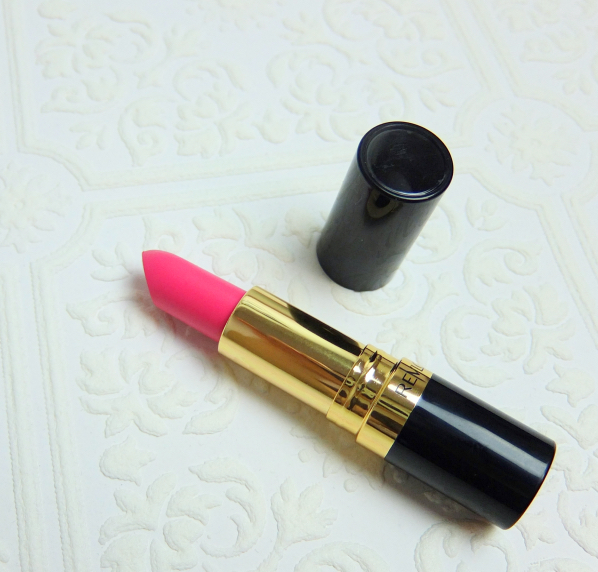 It glides on the lips and feels super light. Coverage is sheer to medium and definitely buildable. The color lasts on me forever leaving a pretty stain behind (it withstood a Thai curry dinner). 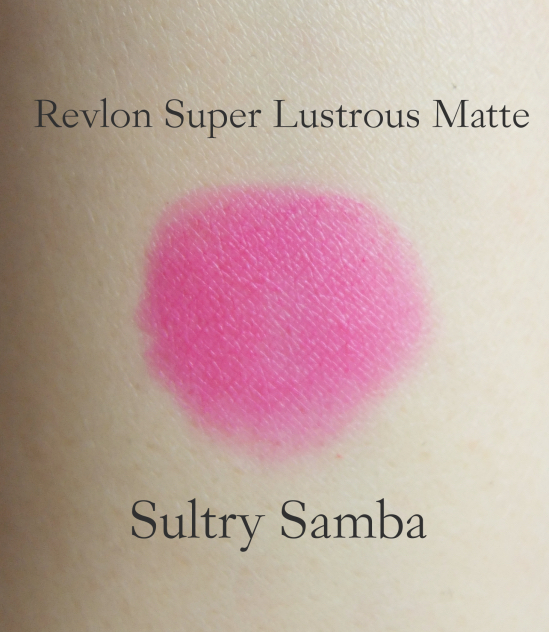 Judging from this beautiful comparison swatch I found online, Sultry Samba looks quite similar to Chanel Rouge Allure Velvet La Viva. More importantly, my lips stay comfortable and flake free. Much better than some of those glossy sheer lipsticks, I say! I think Revlon Super Lustrous Matte (or even their Matte Balm) might be as good as Chanel Rouge Allure Velvet, but how would I know for sure until I compare them, right? Something like La Romanesque looks perfect for that comparison. Just saying. So pretty, Lena! I tend to prefer bold colors in a matte finish because, as you say, it gives a sense of balance. I do sometimes wear bright colors in satin or shiny finishes, but when I do, I feel like the color and the finish are competing for attention. Also, I just listened to your "Air on the G String" performance and it's absolutely wonderful. It makes me nostalgic, too, because my father is a classical guitarist and he played a lot of Bach when I was growing up! I understand what you're saying. For example, I really adore the color of Revlon Fire & Ice lipstick but can't really put it off because of its finish. And I am totally enabled for La Romanesque. ;p I even want the matching polish. Ah.. I really like the Super Lustrous range but I've never tried the matte ones. It's a lovely colour Lena, very pretty on you! That is super pretty. I haven't tried any Revlon mattes. I was lusting after Chanel's La Romanesque and if you're saying they are similar, I might have to try and find Samba! I've been thinking about La Romaesque ever since you featured it on your blog. I wasn't really sure about the matte finish itself, which is why I was hesitated. Now I can't wait to get my hands on it! Maybe I should take a look at some of Revlon matte balms, too! I kind of dismissed them after I got disappointed by their lacquer balm. Gorgeous shade! I'm a huge sucker for pinks like this. It looks lovely on you :) Revlon make some amazing lip products - and at a generally affordable price point too. I still have a few Revlon mattes with matte tubes (mostly red colors), and they are great, too. Lighter colors didn't perform as well, or it is how I remember them. Thanks! This would be a lovely color on you as well, Jen! i'm a big fan of mattes (but i found the revlon matte balms to be inconsistent why you applied them. esp that super purple one) and this one looks really great. there's something a little bit more edgy about a bold color + a matte finish so i know what you're getting at with that point. A perfect Lena shade! So pretty on you! Revlon makes great lipstick I think! I love mattes-I find they stay put better on me. I love a matte lipstick, though I usually prefer darker shades. This pink one looks great on you anyway, so I should give it a Go! I like that it's not a flat, one-dimensional matte! That slight dewy finish gives your lips a really nice definition! :) Pretty girly happy pink, too. I like! You're right, Jaa. I think I like it a lot because this lipstick has such a flexible coverage. It definitely isn't like the MAC retro mattes. Beautiful, Lena! It looks lightweight, for a matte! I love mattes *_* I agree that a bolder, brighter shade adds balance; I also think that a matte red lip can look less intense than a creamy one. It IS about balance, as you said. As for mattes...can I suugest the NARS pure matte line? :D My fave! I think you're right! I like the few other Revlon mattes I own, but Sultry Samba seems to be lighter and sheer adhearing better on lips, too. That looks gorgeous! Exactly the type of colors of lipsticks that I like! It's nice that it looks like it has a bit of sheen. I'm not a huge fan of really matte lip colors. This is such a fluorescent color, like it! Gosh, this looks amazing on you! I wasn't too sure about it when I just saw it in the tube but it looks very flattering on you. I guess it has a lot to do with the light sheer nature of the color. It gives a good coverage but still manages to look natural. I don't think I'd like it as much it it was fully opaque. Matte formulations definitely seem much better and less heavy and drying these days. This vibrant shade looks amazing on you Lena! It's such a bummer that you lost your makeup bag along with your P & J blotting case :( I'm not sure if they make it anymore as I've shopped around for a backup to mine and had no luck. You might be pulling out your hot pink Baggu more if that bag law goes into effect in NYC. Thank you, Rowena. :) It is a happy discovery for me. I actually bought another affordable matte lipstick in bright orange red, and it is good quality as well. This shade is sooo gorgeous! Despite revlon being such a hit in the lip product section I don't own a single revlon lipstick! I really need to give their lippies a shot! Such a fan of these blue toned pinks...just dying over here! It looks fantastic on you! You should definitely try Revlon SL lipsticks. They have at least 4 different finishes, too. Anyway, I have tried one of Revlon's matte lipstick (Stormy Pink, it was a thing waxy mess) and kind of hated it but everybody raved about the other ones in the matte formula (strawberry suede, if Kate/Driveller and Lisa Eldridge like it, the formula must be really good). 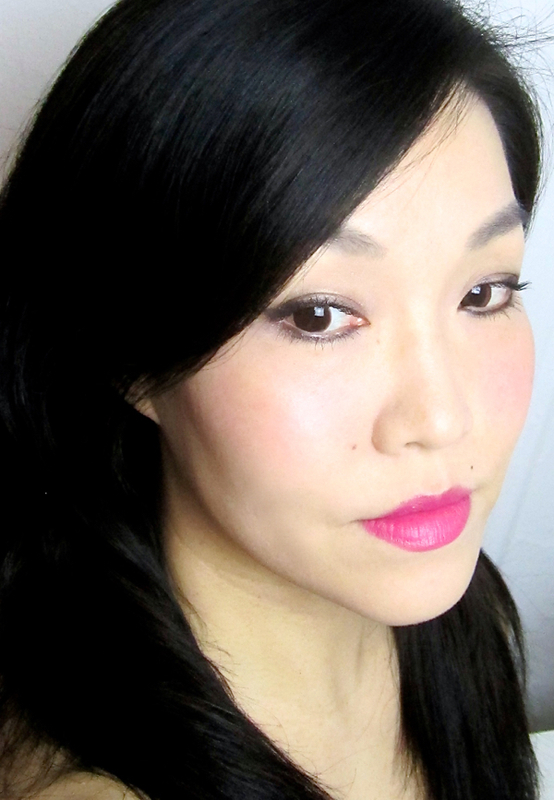 Btw, I have picked up the LE L'Oreal Matte Lip Cream (one in orange red another one in a hot pink like Sultry Samba)and the formula is surprisingly comfortable and non-drying, and somehow the color doesn't look trashy/aging either...I am pretty impressed. I actually had those two Revlen mattes you mentioned. I totally agree with you on Stormy Pink being not good. Mine was quite crumbly for some reason. Strawberry Suede wears a lot better and is a beautiful color for sure, but it looked too warm on me, so I purged it a couple months ago (did I make a mistake..???) I also love Really Red and In The Red - very very good quality. This is truly beautiful on you, Lena! 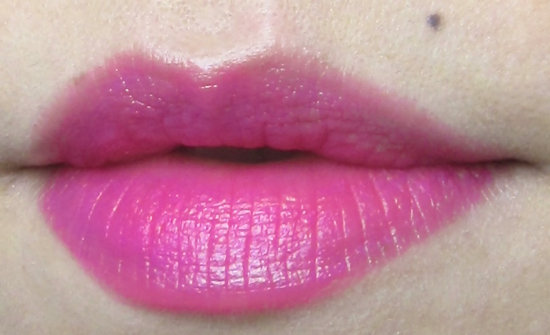 Love you in hot pink lipstick, and I second Jaa - love that this one isn't flat matte and has a bit of sheerness to it. Truly lovely! I have this one too and I agree, it's pretty! High-end pretty! :-) Love the color on you, it really brings your face to live. Hi Melissa, thanks for the compliment! That's gorgeous on you Lena!